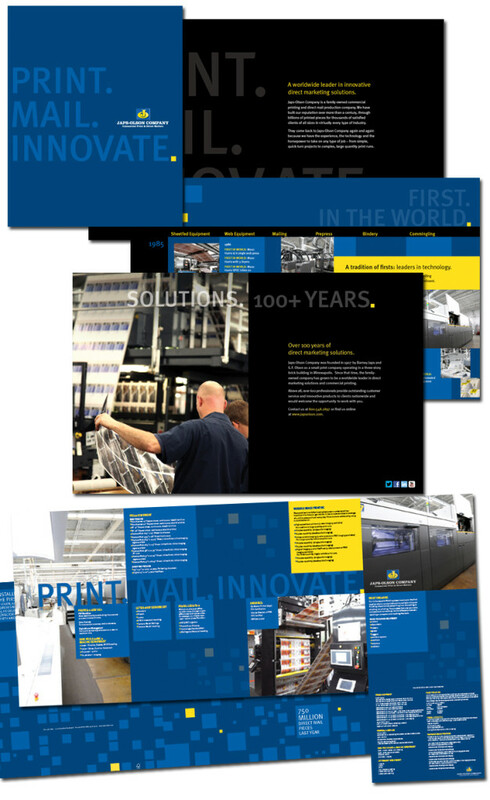 Tasked with creating new sales material for Japs Olson printing company, d.trio jumped at the opportunity. We wanted to create something that balanced the strength and history of the company that also showcased their leading edge technology. We started with a campaign theme, “Print. Mail. Innovate.” We added a rich deep blue color to the campaign palate, and eliminated some of the more vibrant colors from the JO palette to create something upscale and full of rich tones. The components created include: an equipment list, a folder with pockets, a brochure and an outer wrap to hold samples and other collateral.